Innovation is an oft-heard buzzword in both public and private sectors concerned with the organisation and delivery of services to vulnerable individuals. This thoughtful volume explores what innovation might actually involve in the context of contemporary human services. Highlighting both the importance and utility of innovation but also promoting a more reflective approach, the book distinguishes between innovation and improvement and discusses the relevant differences between private sector, public sector and non-profit organisations. It looks at how innovation is often as much a result of the power relations between the involved actors, and the structural context, as a result of popularly identified ‘drivers’ and ‘barriers’. Including numerous case studies, the book illustrates and explains innovations in welfare services at different levels, looking at the macro level (innovations in social policy), the meso level (innovation at organisational level) and the micro-level (user-driven innovations). Arguing the innovation is nothing new in human services, the authors emphasise the importance of innovation being developed and supported by those working within those organisations. New and creative solutions to problems encountered in everyday work by front-line workers can be taken up to improve services provided and make a difference for the users, rather than change being externally imposed upon them by those without insider knowledge. 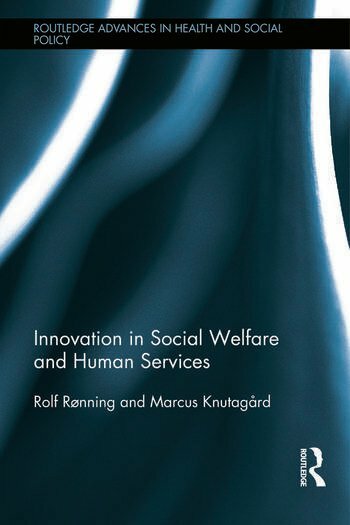 Innovation in Social Welfare and Human Services is an important read for researchers and practitioners interested in the administration, leadership and organisation of social services. Rolf Rønning is a professor of social policy at Lillehammer University College, Norway. He has for many years conducted research and been published in the field of welfare policy. His main research interests now lie in the area of innovation in the public sector, with welfare services as the main focus. His recent publications include Framing Innovation in Public Service Sectors. Marcus Knutaga°rd is a researcher and senior lecturer at the School of Social Work, Lund University, Sweden. His current research interests include work on the moral geography of homelessness, category formation in the field of homelessness and social policy and housing. With colleagues at Lund University and at Lillehammer University College, he has recently written a book on innovations in welfare services with a special focus on social innovations.